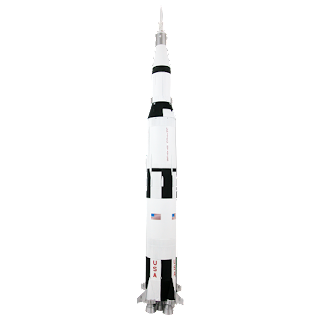 The Estes 002157 - Saturn V is a stunning 1/1000th scale flying replica of the incredible Saturn V rocket that took men to the moon. It’s hard to believe that the Saturn V rocket is still the most powerful, the tallest and the heaviest rocket that has ever been in operational use to date and its first ever launch was way back in 1967.The Apollo missions, which flew its first manned light in 1968, landed men on the moon in 1969, and ended in in 1972, were watched by millions of people on TV, all around the world and the world thought that it was watching the dawning of a new era for man in space. Sadly, though, the amazing feat of sending men beyond low Earth orbit has never been repeated. Each launch of a Saturn V rocket cost in the region of US$ 0.71 billion in today’s money, which was the main reason that the cancellation of the project, but you can relive some of the excitement for a lot less with the Estes 002157 - Saturn V flying model rocket! Before we talk about the wonderful scale model of the Saturn V rocket that Estes have produced, take a look at the full sized Saturn V rocket in action. While the Estes 002157 - Saturn V model rocket may not quite reach the heights that the original Saturn V rockets did, it is a beautifully crafted 1/1000th scale flying replica of the original. This Estes model rocket is a Skill Level 4 rocket, so it will require patience and modelling skills to assemble. We must say that this is not a rocket for beginners and it will take time to construct, but the finished result is absolutely superb. The finished Estes 002157 - Saturn V stands at 43.25 inches tall and it will reach an altitude of approximately 350 feet, but you don’t build an Estes 002157 - Saturn V Flying Model Rocket for performance, you build it because it is such a cool looking model rocket. 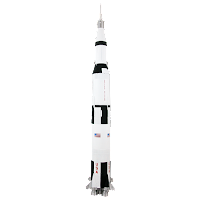 The Estes 002157 - Saturn V model rocket is a superb collector’s piece for the serious model rocket enthusiast. As it’s a Level 4 Skill level model rocket, you will, of course, need to have a suitable launch system and you will need to have, or buy, additional modelling tools and supplies to complete the assembly. The recommended engines for the 002157 - Saturn V flying model rocket, according to Estes, are D12-3, E12-4 (first launch), E30-4. The Estes Saturn V Flying Model Rocket is a superb scale model of the rocket that took men to the moon. It was scaled from official NASA drawings, so the detail is accurate too. Check the latest price of the Estes 002157 Saturn V rocket on Amazon here, but at the time of writing it was only $67.99. Not bad for a scale replica of what is arguably mankind’s greatest technical achievement to date!